We have been hearing more about the new LG G7 ThinQ smartphone over the last few days and now a photo of the handset has been leaked. The picture above is apparently an official press render for the new LG flagship. 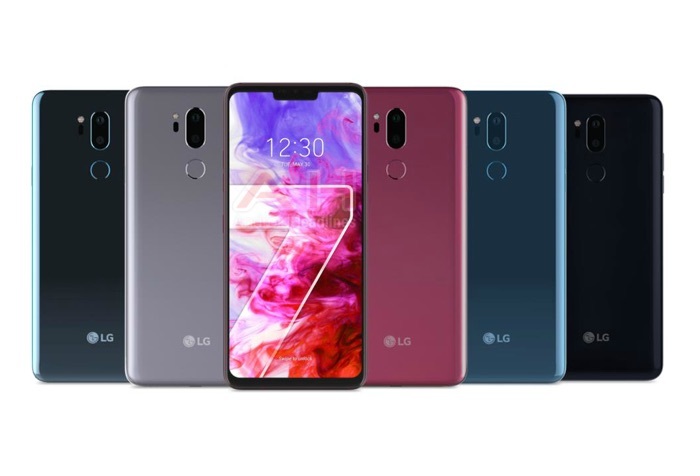 The handset will apparently come in a choice of five different colors, these will include Platinum Grey, Aurora Black, Moroccan Blue, Raspberry Rose and Moroccan Blue Matte. We previously heard some specifications for the new LG G7 smartphone, the handset will come with a Qualcomm snapdragon 845 processor. It will also come with 4GB of RAM and 64GB of storage. There is also the possibility of another version of the handset with 6GB of RAM and 128GB of storage. The device will feature a 6 inch LCD display with a QHD+ resolution of 3120 x 1400 pixels. As we can see from the picture that the handset will come with a notch at the top of the display, it will also feature dual rear cameras. Previous rumors have suggested that the rear cameras will feature 16 megapixel sensors. The handset is also said to come with a 3000 mAh battery. LG are expected to make the device official some time this month.